Why do recruiters choose some candidates over others, even where there is little difference in skills and experience? It's all down to having a good CV. What's more, a great CV can get you an interview even if you don't meet the exact job specification - and even if other candidates have a more desirable background. In this guide, we'll show you the skill of CV writing - from the bare basics through to adding pizzazz. 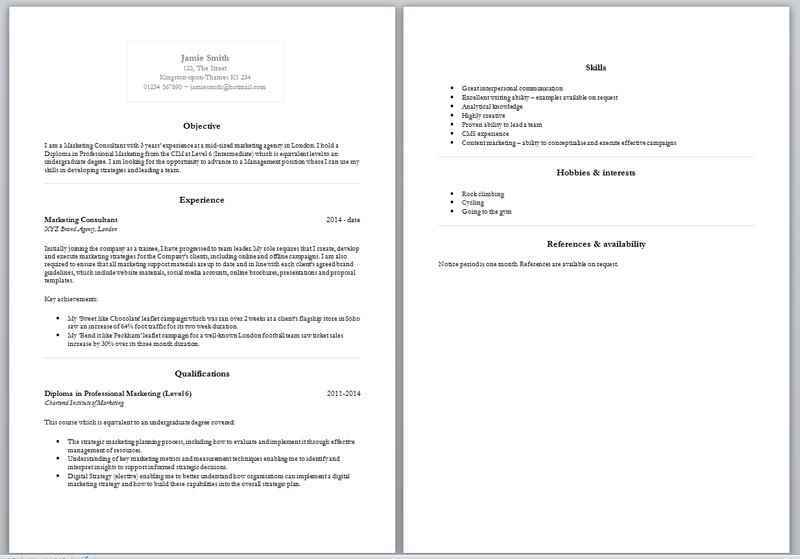 Typically a CV should be no more than two pages. Recruiters don't have a great deal of time so only spend a few seconds looking at each CV. They need a short succinct summary of your experience and qualifications. Your CV should contain just enough detail to convince them you are potentially a good candidate. For some high level positions, such as a medical position, more pages may be appropriate. In this case you might detail your contributions to journals and other publications. This will help you to establish specialism in your field. Your choice of CV template depends on the type of role you are going for. For most administrative and professional roles, a basic CV template will be appropriate. This should contain minimal or no graphics, and no unusual fonts. For roles where there is an element of creativity, it may be more appropriate to choose a creative CV template. With the exception of your name and personal details, each section should be presented under a heading. This makes it easy for the recruiter to locate the information they need. Under the Equality Act 2010 employers aren't legally allowed to discriminate against you on any of the above grounds. However, you don't want to give them any opportunity to do so. The only time this information would be included is if it is highly relevant to the job. For example, a French teacher might want to mention that they are actually a native French person. Your objective is a brief summary that tells recruiters who you are, what you offer, and what you're looking for. The employer only spends a few seconds on each CV. The objective should therefore be between 2 and 4 lines (3 is ideal). With hundreds of potential candidates, recruiters often scan this section for key information. The best objectives are snappy and straight to the point. (b) spell out how you meet it. "I am a Commercial Property Solicitor with 4 years PQE. I have a sound technical knowledge of all commercial property matters together with strong communication skills and excellent attention to detail. My excellent time management and organisational skills allow me to manage a small team of 3 whilst handling my own busy and varied caseload. I am an experienced user of Microsoft Word, Excel, Powerpoint and Outlook." Note that this statement DOES NOT copy word-for-word from the job advert. Instead, the requirements of the advert have been rephrased. You will note that every single requirement is mentioned. The above represents a very strong objective statement for the job specification. Subject to the rest of the CV being acceptable, the candidate would likely be offered an interview. Point to note: Your cover letter will be similar to your objective, but with a little more detail. It will introduce yourself and explain how you meet the requirements of the job. Click here for our cover letter guide. The work experience section tells prospective employers who you have worked for in the past, including your most recent position. Some people use other titles for this section, such as ''Employment History', 'Work History' or 'Professional Experience'. It should be presented chronologically with the most recent experience first. Note that if you are still in the position, you should write (2011 - date). If you write (2011 - 2017) this implies that you have left the position in the current year. Carefully review the job specification for the role you're interested in before writing this section. Add more detail for the work experience you've had that is directly relevant to the role you want. If you have a lengthy work history, you may wish to include only relevant work experience. You will notice above the inclusion of 'achievements'. This is because the recruiter is not only interested in the responsibilities you were given, but also in your results. Some people don't bother listing GCSEs/A Levels if they have higher level qualifications (undergraduate/post graduate degrees). This is because lower level qualifications can take up valuable space. Alternatively they may just reduce lower level qualifications to one line and summarise them. What you choose to do depends on how much space you have. It also depends on how many qualifications you have and what your grades were. Exceptional grades may be worth mentioning, even for lower level qualifications. It's also usual to include where you obtained the qualification. However, this may be omitted for lower level qualifications. Skills may be divided into hard skills and soft skills, although you don't need to label them as such. Hard skills are measurable skills such as typing or using software. You can view a list of hard skills here. Soft skills are important skills that are not specifically measurable, such as communication. Read the job specification and pick out which key skills are required. Incorporate brief examples of how you have demonstrated those skills in your work experience section. If a skill is fundamental to the job role you may also want to mention it in a separate skills section. Learning : "Although I came to the role with no knowledge of the industry, I now train both new team members and team leaders." Prioritising : "My extremely heavy work load required me to effectively prioritise tasks. I also delegated routine work to junior members of the team where appropriate." Networking : "Through attendance at conferences and networking events, I brought 4 major customers to the firm in the first 6 months." Leadership : "During my time at XYZ Corp I led a team of 5 people. I met all deadlines and exceeded all sales targets for our team." Handling difficult people/situations : "My role required me to deal with customer complaints. I always ensured the customer had a satisfactory resolution." Communication : "It was my responsibility to chair monthly meetings and conduct brainstorming sessions. I also prepared all meeting agendas, recorded minutes and compiled post-meeting reports. This required the ability to communicate common goals to a diverse team." Presentation : "My role frequently required me to present the results of monthly reports to senior management. I also delivered effective presentations to prospective customers." Creativity and innovation : "My ‘Sweet like Chocolate’ leaflet campaign ran over 2 weeks at a client’s flagship store in Soho. This saw an increase of 64% foot traffic for its duration. It also earned me a nomination for Best Print Leaflet Campaign 2017." The hobbies and interests section is often dismissed as one of the least important sections of a CV. Sometimes it is excluded altogether! However, this is the part of your CV where you can show the employer something of your personality. This section is also a great opportunity to tell your employer that you take your health and fitness seriously. Such employees are desirable because they usually have less sick days. Include 3 - 5 hobbies in a bullet point list and avoid any hobby which might be seen as a negative. It's best to avoid anything too quirky at this stage as well. Such hobbies should be saved for when you've got to know your colleagues better! They should not be included because they translate to a Monday morning hangover from your employer's perspective. Typically, you would offer one reference from your most recent employer and one personal reference. The personal reference could be your university tutor or a friend (preferably a professional). Employers don't always ask first before contacting your references. Indeed, they may do so before they've even given you an interview. Many candidates don't tell their current employer that they're job hunting. For this reason, if you're still working, it's best to simply write "references available on request" instead of listing contact details. (b) the amount of space you have (keeping within the 2 page limit for most positions). A great many vacancies these days require that you submit your CV via email or through an online platform. This gives recruiters the opportunity to search CVs for relevant keywords. Logically, if you want the best exposure, your CV needs to include the right keywords. Therefore this means tailoring your CV to the exact job specification for each role. This covers all bases because the recruiter may search for either. Fellow of the Chartered Institute of Legal Executives. This is needed because the recruiter may search for any of these combinations to filter relevant CVs. 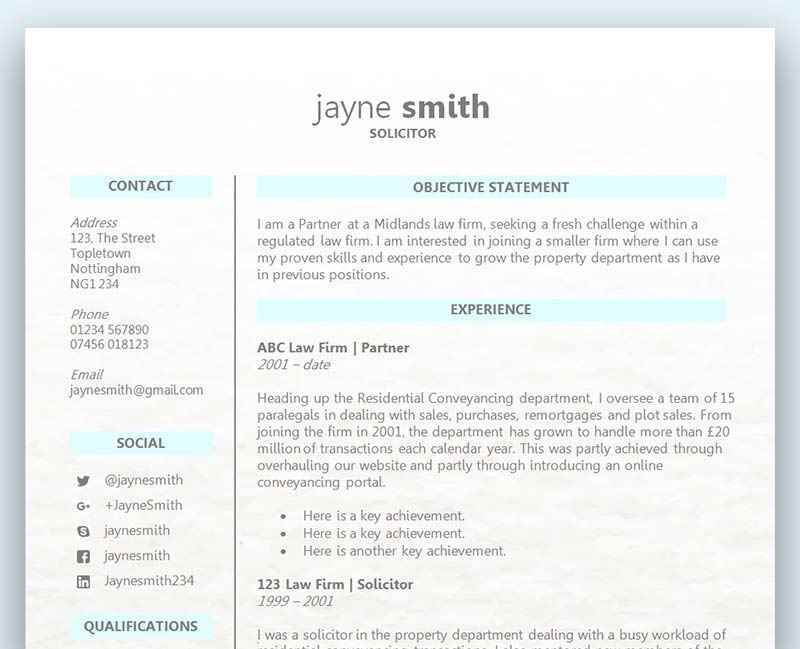 Now you know how to create a CV, why not choose your perfect CV template? We've also got lots more articles on CV writing to help you below.